Lee Bul is one of the most important Korean artists of her generation, having received significant international recognition for her formally inventive and intellectually provocative work. In the Gropius Bau presents Crash, her first solo exhibition in Germany. Lee Bul’s diverse body of work comprises of performance and installation art that explores dreams, ideals and utopias influenced by futurist theories and science fiction, bio-engineering and visionary architecture. Crash seeks to enthrall and spark the imagination of many as a multi-sensory experience composed of several experimental elements. The works on display are characterized not only by sensual expressiveness and humor, but also by Lee Bul’s own experiences with and subtle allusions to the history and politics of Korea. Lee Bul's expansive stage sets and landscapes experiment with unusual materials such as mother-of-pearl, crystals, leather or velvet, revealing imaginative topographies and revisiting utopia. Throughout her now 30-year artistic career, Lee Bul has been witness to South Korea’s evolution – from military dictatorship to democracy in perpetual confrontation with North Korea, located only kilometers away. Recently I fall in love for a postwar architecture expression made by Fehling+Gogel. Largely influenced by Hans Scharoun, Bruno Taut, and Erich Mendelsohn, the French-German office designed concrete and sharp architectures, that often reveal an extraordinary common space due its complexity. Below the ones I had chance to visit and admire! The design competition, for the Berliner Institute, was limited to 14 participants and it was characterized by emblematic jury components like the Werner Düttmann and Hans Scharoun. 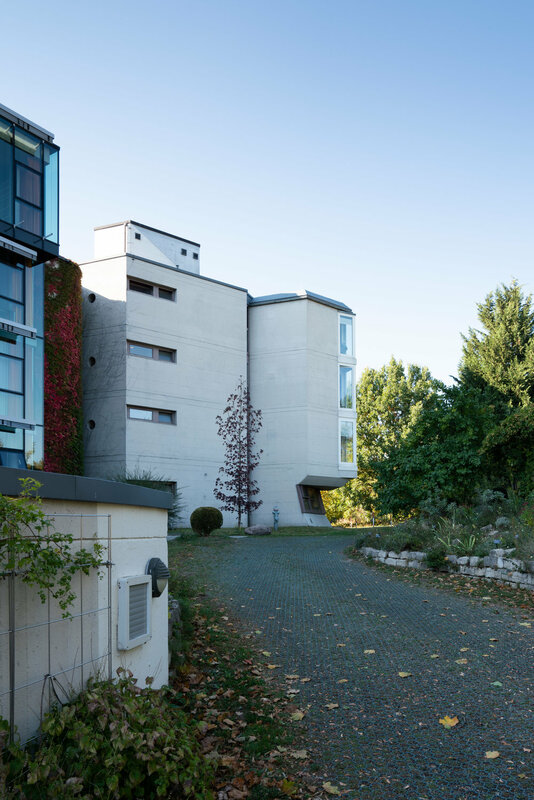 In fact, the presence of Hans Scharoun traced from the beginning, a certain architectural direction and, on 1966, Hermann Fehling and Daniel Gogel were unanimously selected as winners. They realized one of the central motifs of Expressionist architecture: the city crown. The overall form of the institute has its roots in the 1920s. At that time, Bruno Taut, Hans Scharoun and the Luckhardt brothers dreamed up so-called "people's houses" in visions of future architecture, which as places of culture and assembly would be an integral part of a free society. On the west side, three wings of linearly arranged office cells extend from the large stairwell, the ends of which are in turn connected to other office tracts. East of the lobby is the big hex of the library. The cafeteria and conference rooms are located to the left and right of the main access axis in front of the building and flank the entrance. Thus, the main entrance to the narrow passage and the staircase behind it to the surprise effect. From the easternmost component of the refectory grows another extension, a low building, which contains the so-called "experimental station" and a caretaker's house. Where simple functionality is required, within the rowing and stacking of office cubicles, the construction follows a right-angled construction grid. But wherever employees meet - and where communication is supposed to take place - there are spaces of spectacular polygonal design. Fehling + Gogel repeatedly interpreted diagrams of social processes as spatial structures both before and after this draft. As was to be expected for a building of this size, the users already registered the first change requests during the planning phase. From the competition design to the built state, the design was modified several times due the architectural program requirement. With its single-shell concrete walls and large surfaces, the building has extremely poor thermal insulation. Operating costs and energy balance cloud the picture of the architectural marvel. However, this "unfavorable" design plays the central role for its artistic and contemporary historical significance. The complex and articulated lobby is a masterpiece for its design, high, number of stairs, connection and specific detail aesthetics. The Institute for Hygiene and Microbiology was commissioned by the Freie Universität Berlin - as a supplement to the Benjamin Franklin Clinic. The framework planning for the institute building began in 1964, from 1966 Fehling + Gogel worked on the planning of the building and built it from 1971 to 1974. Great emphasis was placed on the quality of the exposed concrete of the building envelope. In order to obtain soft curves and a fine surface structure. This result is a consistent fair-faced concrete construction, which is unique in such a careful execution in Berlin. The design responds to the neighborhood by gradually increasing the building masses and placing a five-story office and laboratory bar with the frontage facing the old village center. The lower components are arranged around this central bar: auditorium and seminar hall, animal testing laboratories and nutrient chamber kitchen. The geometric structure and the Y-shaped floor plan of the building take their place in the arrangement of triangular supply shafts. This building deffer to the other institute designed in Berlin and Germany for the design use of the shafts treated as a central design element and unfortunately, compared to other scientific buildings, the Institute for Hygiene and Microbiology does not have a large common space, due the large request of laboratories and hall space. 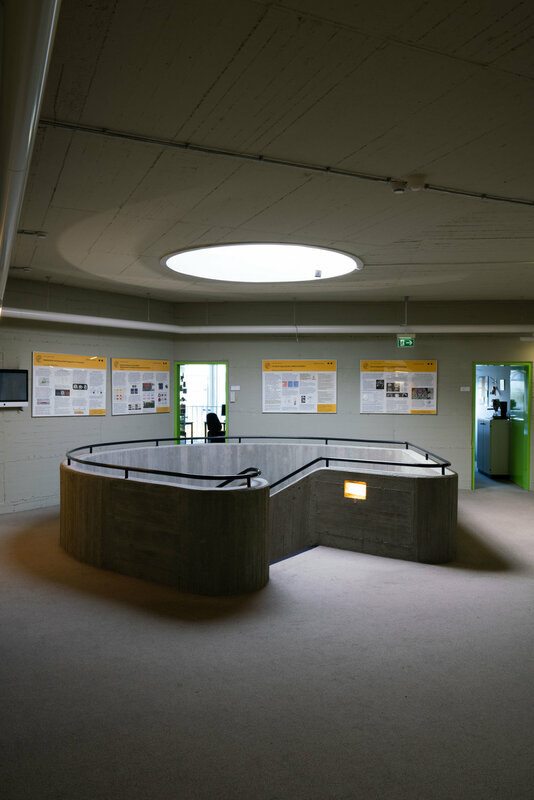 The institute extended the Institute of Meteorology on the Steglitzer Fichtenberg, it was not completed until 1990 due to a local citizens' initiative against the project, twelve years of planning and construction were required to complete it. The existing institute building, was divided into departments of psychology and meteorology until 1983. Both used the two-story building on a U-shaped floor plan. The extension consists of an S-shaped extension in the plan, which completes the courtyard of the old building, gives the ensemble a striking, back and forth swinging street front and attached to a 30 -meter-high steel tower for weather observations. The swinging bar of the extension stands on short supports over a free ground floor and offers sheltered parking spaces for cars and bicycles. The building continues south in another curve to the box of the library. During the long planning phase of the Meteorological Institute Gogel designed the building almost completely new, on the one hand to meet the demands of the citizens' initiative, on the other hand to take into account the then new heat protection regulations. For the observation tower of the institute, Fehling + Gogel had initially provided a closed pulpit and an external staircase, but a less elaborate variant was realized: a tall steel tube houses that stand in the back of the new building. In front of the institute stands a sculpture by the sculptor Rolf "Titus" Szymanski. The St. Norbert Church of Karl Kühn, which was inaugurated in 1916, was badly damaged during the war. In 1958, a conversion with a partial demolition was decided. The preserved church hall was modernized and supplemented by new buildings. Today, additions on three sides of the nave take on a christening chapel, a kindergarten, the municipal administration and an entrance hall, inside the church hall was added a new organ loft. The Paul Gerhardt Church is a modern reconstruction of the destroyed in World War II church of 1910. It stands on the main road next to the baroque Schöneberg village church and belongs like this to the Protestant community Alt-Schöneberg. With other community buildings, it forms an ensemble, which leads from the main street to the St. Norbert church and thus creates a passage to Dominicusstraße. Fehling + Gogel also planned the modified reconstruction of the neighboring Catholic St. Norbert Church. In 1965-66, the ensemble was expanded to include a third draft, the Community Center, called the "Superintendentur". The time-typical motif of the tent for the church is indeed taken up, but broken by the fact that the roof is connected to the outer walls to an irregular body. The resulting triangular geometry determines the layout of the façade, in which closed concrete walls and large-area glazed openings alternate. The landscape designer Hermann Mattern was responsible for the design of the open space. The "Interbau" 1957 not only included the well-known buildings of the Hansaviertel and Le Corbusier’s Unité d'habitation in Westend-Berlin, but as well Exhibition halls with classic exhibition stands. Also the Berlin fairground on the Messedamm was used by the "Interbau". At this location Fehling, Gogel and Pfankuch realized for the Association of the glass processing industry an unusual booth. In the design, the architects experimented with a development principle that was should later point out as a key feature of their work. Different heights platforms were arranged around the central tower of the fair pavilion . The visitor's path spiraled upward, moving away from each level Visions to the other height levels revealed. The impression of a vertical stacking was canceled, although the building took advantage of the height of the exhibition hall. The competition design dates from 1956 from the team Fehling, Gogel, Pfankuch. However, picked up the three for the construction and execution of the Architects Günter Ssymmank on board. Ssymmank was an employee in the office of Hans Scharoun and designed there among other things the large ball lights of Berlin Philharmonic and State Library. Ssymmanks Flower lamps are considered design classics of the 70s. He brought his expertise on plastics years later when building house treasure, for the project "Glaspavillon" he designed the steel construction details. The steel skeleton The pavilion was equipped with panels of different glasses to the wide range of material variations. As an eye-catcher, two large cantilevered covered the pavilion areas. They stretched diagonally up and out, their colored glass plates were dramatically lit. Together with the reflection on the artificially created The surface of the water, in which the pavilion stood, gave the impression of being an expressionist Future vision. On the background appear the petite glass pavilion of Cologne Werkbundausstellung design by Bruno Taut (1914), a large influencer on the architects approach to common space. That served to open the structure of Fehling, Gogel and Pfankuch as a confident answer for the modern living. The radiant tower, which is surrounded by floating bridges, inspired the film architecture from Fritz Lang 's Metropolis as a smaller equivalent of the reality. At the end of the "Interbau" events, the walk-in sculpture was dismantled. Plans, sections, and archive pictures are published with the permission of Karla Gogel-Pfefferkorn. They were scanned in the course of an exhibition project by Gunnar Klack and Matthias Seidel in 2009. Special acknowledgment to the Public Relation employed at the Max Planck and the Meteorology Institute. "I love peeling back the layers of Berlin" | Atlas of Berlin is an ongoing contemporary Architecture mapping. Made with love since 2016 for the Architecture enthusiasts. Sign up to receive the last Post and use the above Free map on your Google Map App! I hope you will enjoy the next Blog-post!